Autumn in New York. I love it…the sights, the smells…and of course the mandatory pilgrimage to the perfume floor at Bergdorf's to buy my annual bottle of Caron's Nuit de Noel, which has been my signature perfume from November 1st until New Years day for years. But this year I was coming to Manhattan for another reason and that was my youngest nieces bridal shower held in New Jersey on Sunday afternoon! But my sweet husband Jim knows that a trip anywhere near the city without actually going into the city is a bit like waving a steak in front of a starving man so he snuck me into the city for an absolutely whirlwind Friday and Saturday. We escaped to a glorious room at The Warwick, ate some pretty fabulous food and just relaxed for a bit. Needless to say , I'm pretty happy right now especially after a weekend filled with many glasses of champagne , plenty of raw oysters, freshly baked gougere and a quite a good bit of perfectly ripened cheese and charcuterie. Friday night before we were to meet some young friends for supper at Ed's Chowder House ,(If you've never been please go because the loaded chowder is INCREDIBLE and the Manhattans are PERFECT!) 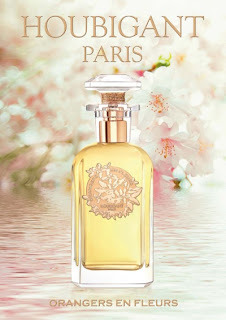 I ducked into Bergdorfs hoping to see my friend Tom, who IS the very essence of Annick Goutal! We chatted for a bit and he generously showed me all of the newest perfumes , taking me around the store, introducing me to everyone and just generally being his wonderfully generous and informative self. I chatted, flirted and sniffed happily for an hour but I should have known that he was saving the best for last. We walked back to his area and he turned, smiled at me and said…"Try this. It's fairly new for them and absolutely exquisite". I looked and realized that we were standing by the Houbigant counter…a French perfume house that I have loved since I was a very young woman who fell head over heels for Quelques Fleurs; a classic and lovely floral that worked well in the romantic white linen soaked days of the early 80's. He sprayed a bit into the air and I sniffed. I experienced a sudden and powerful feeling of delight…"Please? Some more?" So he sprayed again and I walked into the loveliest cloud of orange blossom that I'd ever experienced. 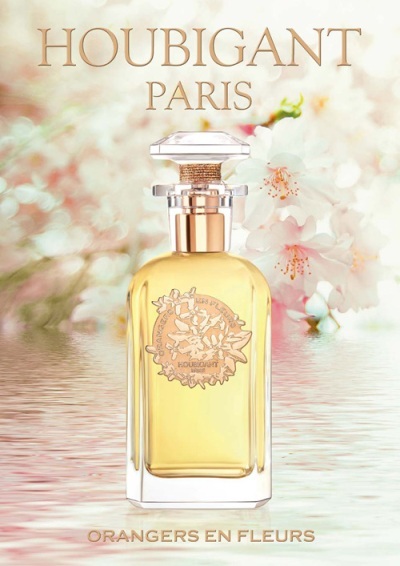 Houbigant's Orangers en Fleurs is absolutely beautiful, with a hint of rose infused honey butter, tuberose and plenty of spice; incredibly sensual and truly very seductive in a way that only the French can pull off. There's also something fairly fabulous that I'd never heard of before…a luxurious accord named "Eau de Brouts" which is lovingly derived from orange blossom leaves, twigs and flowers. I adore Orangers en Fleurs and it lasts on my skin for along time which is unusual for me when it comes to orange blossom perfumes , indeed if I spray it through my hair before bed, it's still there in the morning and in the most delightful way. Tom tossed me several samples which I took back to the hotel. When I walked in Jim grabbed my wrist knowing of course that within seconds I would ask him his opinion and he smiled wickedly…. "It's a little too cold, a little standoffish" he said. "I think that it needs to be warmer for me to fully appreciate it" and without even asking permission ( The temerity of some men!) he wickedly buried his face in my breasts. When he finally came up for air his only instructions were to go back and buy a bottle immediately. Which I did…and of course I have been wearing it ever since. Has anyone tried a scent calledcarolina rain perfume? It honestly reminds me of home and it is for both men and women.